The First Alert AUTO5 Fire Extinguisher is UL rated 5-B:C and designed for automotive use fighting flammable-liquid and electrical fires. It features an easy-to-use pop-up pressure indicator and a mounting bracket for secure installation. 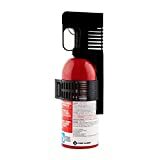 This compact fire extinguisher can be stored in any car or vehicle and has a durable metal head, a metal pull pin with a safety seal to help prevent accidental discharge and tampering, and a chemical-resistant and waterproof label.